From Leak Detection to Water Line Replacement to Submeter Installations, Count On TV Plumbing For All Your Water Line Needs. High water bill? You may have a water line leak. Don't panic just yet as it could be something minor like a leaking toilet or dripping faucets. It may not seem like much, but over the course of a day, week and month, many gallons of water could be wasted. This type of water loss not only adds to your water bill, but also to your sewer bill and at the end of the day, it's not good for the environment. The First step is to locate the leak. Our expert leak detectors are experienced with locating all types of leaks. From meter leaks to slab leak, there are too many possibilities to list. Some leaks are obvious and noticeable right away. If you have a leak in your yard in your front lawn for example, that's probably a water line leak. 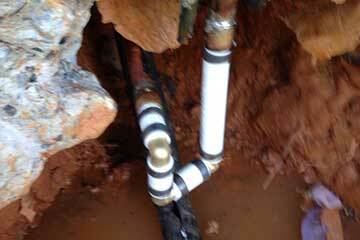 Leaks under a driveway, below a concrete slab or behind a wall are more difficult to locate. Having the correct leak detection equipment and experienced plumber together in one company helps you avoid the extra hassle of hiring a separate company for each job. While some people may want to know the exact location of a leak, its not always necessary to pinpoint the leak if determined that a reroute of the water line is needed anyway. The bottom line is that if you are dealing with a licensed, experienced and reputable plumbing company, the best solution to solving the problem will be presented so you can make the best choice for yourself.